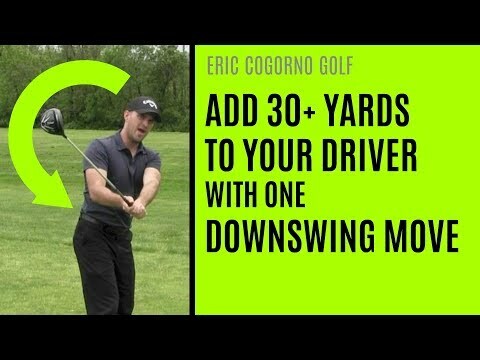 **Get additional free videos from me exclusively at https://fore.cogornogolf.com/video-of-week. You can watch my review of the original version of Live View Golf here https://youtu.be/4SbXTWNdtpc. Let’s talk about how to shallow out the downswing with this “top secret, never-before-seen” backswing move. Obviously I'm kidding a little bit about this, but this is something that doesn't get talked about that can shallow out your downswing. The main component that you need to understand here - and something we're going to do more in depth videos about - is this equal and opposite theory. 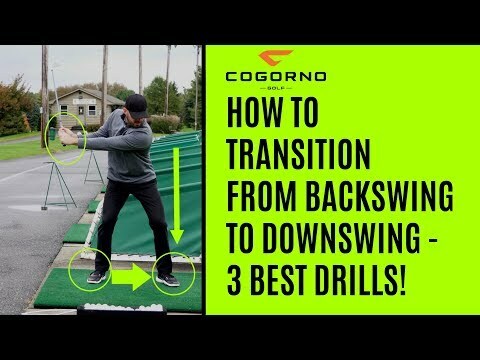 Whatever you want to do during the downswing, you're probably going to have the best chance of doing that if you do the exact opposite of it going back. At the top of the backswing, what are the pieces that I want to do to shallow out my downswing? The club, the grip, the shaft goes from whatever angle it's on to a flatter angle. That would be shallowing. The club gets flatter or more laid down. When the club shallows, the back of my left hand goes up towards the sky and my left elbow goes away from me towards the target. So, what's the theory? If I do the opposite of that going back, I'll get it coming down. So what could I do during my backswing with my left arm and with my elbow to get the opposite and get the club shallowing coming down? If I get the back of my left hand going more down towards the ground, during the backswing and I'd have my elbow point much more towards the ground or even slightly behind me. There's another piece of this. That's where my hands move in space, so again think equal and opposite here. If I want to shallow the shaft, what do my hands do? They go downward and they go towards the ball, down and towards the ball target line. That’s the movement during my downswing, so I need the opposite of that to happen during my backswing. If I wanted to make a backswing to shallow out my downswing, I'd have my hands work “in” a lot and I'd have the shaft be very vertical. Hands most in, shaft most vertical is going to do what? My hands are going to work back out and the shaft is going to go back down vertical. What kills shallowing the shaft is the opposite of that. You want hands in, you want shaft vertical during your backswing. We've talked before about the body motion and that's half of it, this is the arms and hands. If you want to shallow out your downswing, this top secret move (that's not really so top secret) is your hands need to work more inward and the shaft needs to be more vertical. The back of my left hand, the elbow, those things, those are reference points. If I want to get my hands and the shaft vertical, I want to feel the back of my elbow down towards the ground, the top of my elbow more up towards the sky and the back of my left hand towards the ground. - During your backswing, you want the back of your left hand going more down towards the ground and your elbow pointed much more towards the ground or even slightly behind. Let’s talk about how to shallow out the downswing with this “top secret, never-before-seen” backswing move. Obviously I’m kidding a little bit about this, but this is something that doesn’t get talked about that can shallow out your downswing. The main component that you need to understand here – and something we’re going to do more in depth videos about – is this equal and opposite theory. 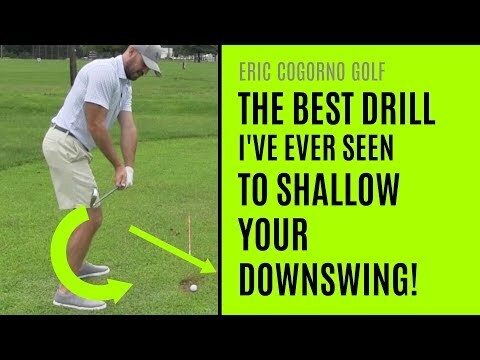 Whatever you want to do during the downswing, you’re probably going to have the best chance of doing that if you do the exact opposite of it going back. At the top of the backswing, what are the pieces that I want to do to shallow out my downswing? The club, the grip, the shaft goes from whatever angle it’s on to a flatter angle. That would be shallowing. The club gets flatter or more laid down. When the club shallows, the back of my left hand goes up towards the sky and my left elbow goes away from me towards the target. So, what’s the theory? If I do the opposite of that going back, I’ll get it coming down. So what could I do during my backswing with my left arm and with my elbow to get the opposite and get the club shallowing coming down? If I get the back of my left hand going more down towards the ground, during the backswing and I’d have my elbow point much more towards the ground or even slightly behind me. There’s another piece of this. That’s where my hands move in space, so again think equal and opposite here. If I want to shallow the shaft, what do my hands do? They go downward and they go towards the ball, down and towards the ball target line. That’s the movement during my downswing, so I need the opposite of that to happen during my backswing. If I wanted to make a backswing to shallow out my downswing, I’d have my hands work “in” a lot and I’d have the shaft be very vertical. Hands most in, shaft most vertical is going to do what? My hands are going to work back out and the shaft is going to go back down vertical. What kills shallowing the shaft is the opposite of that. You want hands in, you want shaft vertical during your backswing. We’ve talked before about the body motion and that’s half of it, this is the arms and hands. If you want to shallow out your downswing, this top secret move (that’s not really so top secret) is your hands need to work more inward and the shaft needs to be more vertical. The back of my left hand, the elbow, those things, those are reference points. If I want to get my hands and the shaft vertical, I want to feel the back of my elbow down towards the ground, the top of my elbow more up towards the sky and the back of my left hand towards the ground. – During your backswing, you want the back of your left hand going more down towards the ground and your elbow pointed much more towards the ground or even slightly behind. Thank you very much! I love this explanation! Exactly what my swing coach and I are working out to fix my slight over the top tendency. Definitely great advice. Outstanding..Eric, you and Clay Ballard are without a doubt the best instructors & communicators I’ve experienced in golf.You have a gift of teaching.Thank you for doing what you do. 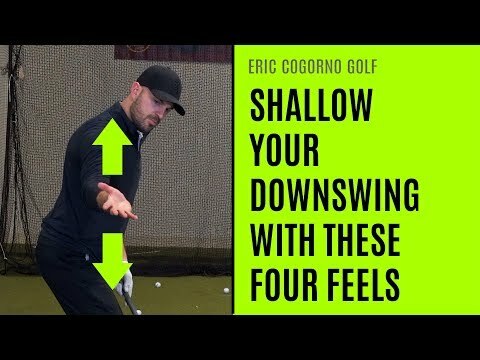 Really the issue for me in shallowing out the downswing has been doing it with my body–shifting my shoulders or my body and not using my hands. Point is to keep a steady head and a more centered one, one should use your lead elbow and arm as you suggest in the video. This reminds me almost exactly of leadbetter's a swing! can you recommend a good body movement video to go along with it. Jim Furyk style. But Furyk said do not follow my style bcoz it has lots of hand and arm movements that is very difficult to master.